With the festive season fast-approaching, many of you will no doubt be hosting parties and gatherings to celebrate. So if you’re looking for ideas you might want to consider sushi as your party theme. There’s nothing quite like a gathering of food-loving friends. And as you’ll see, hosting such a dinner-party doesn’t have to be expensive. There are two approaches you can take when hosting a sushi party. 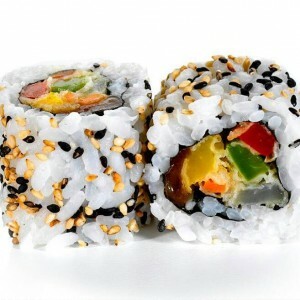 Roll-your-own sushi is very popular these days and allows guests to create their own dishes. This can be a fun way of discovering Japanese cuisine and showing off your creations with friends. However, this can be quite expensive – ingredients are not always cheap! A more cost-effective and convenient approach is to rely on sushi delivery. This can be especially useful if the sushi takeaway and delivery establishments offer custom-made party boxes. At YouMeSushi, we recognise the increasing popularity of sushi dinner-parties and therefore offer an array of specially-made party boxes for gatherings of various sizes. Our party boxes range from small snack-sized creations for small groups to large, feast-size packages that should feed an army of hungry party-goers. In order to cater for different tastes, our boxes can be filled with a variety of delicacies including salmon nigiri, avocado uramaki and of course, our famous temaki hand-rolls. Sushi home delivery in London doesn’t get much better than this! We begin with our Deluxe Party Box, which includes three pieces of salmon nigiri, two pieces of tuna nigiri and six pieces of salmon and avocado inside out rolls. An additional three portions of Salmon Sashimi are also thrown in. The Deluxe is ideal for your average sushi enthusiast and features uncomplicated, but delicious bites to keep the party in full-swing. Well-suited to small and medium gatherings and only £12. Our Salmon Box consists of four pieces of Salmon Nigiri, six pieces of Salmon and Avocado Inside Out Rolls as well as six California Rolls. This is perfect for fans of Western-style Sushi who’d also like to sample more traditional ingredients. Made for small to medium gatherings and those who would don’t want to break the bank when hosting their party. Like the Deluxe Box, its only £12. The Nigiri Box features two portions of Salmon Nigiri, two pieces of Tuna Nigiri as well as two pieces of Prawn Nigiri. For good measure, we’ve also included six Salmon and Avocado rolls and another six Tuna Maki Rolls. Ideal for small/medium gatherings and well-priced at just £14.45. Our Sea Box resembles our Salmon Party Package but on a much grander scale! Included are ten pieces of salmon nigiri, six pieces of salmon and avocado inside our rolls, six California rolls and six salmon maki rolls. Oh, and there’s another eight portions of salmon sashimi to keep your guests occupied. At £27.43, our Sea Box should be more than sufficient if you’re hosting a medium to large party. Created with large gatherings in mind, our Group Box features a 72-piece selection. Included in this extensive party box are multiple portions of salmon nigiri, salmon avocado as well as twelve California Inside-Out Rolls and another twelve pieces of Salmon Maki. Sixteen portions of Salmon Sashimi are also thrown in. Not bad for £49.95. This box is ideal for seriously large dinner-parties and features a wide variety of sushi intended for more adventurous tastes. The contents of this extensive package include twelve portions of salmon nigiri, twelve pieces of tuna nigiri, eight spicy rainbow rolls and twelve California uramaki salad leaves served with ginger and wasabi – a snip at £99.00. At YouMeSushi, we try to cater for every taste. So we’ve also included party boxes for vegetarians and health conscious customers. Our Omega 3 Box features Omega3-rich sushi for just £8.95. The box includes salmon maki, avocado maki as well as salmon and avocado uramaki. For vegetarians, we’ve come up with the 18-Piece Veggie Box which includes four pieces of Japanese omelette nigiri with six portions of vegetables and cream cheese uramaki. We’ve also added six avocado maki rolls and two portions of poached Tufo Nigiri. Our party boxes cater for a variety of tastes and are great if you’re not that confident in preparing your own sushi. Or perhaps you’d prefer to just relax and enjoy your own party without the hassle of cooking? If you would like more information about our party-boxes, please feel free to give us a call. We’ll be happy to help you decide on the most suitable box for your party. Why not take advantage of the best sushi delivery London has to offer? This article was posted in Sushi Delivery, Try Something New. Bookmark the permalink.